Growth is a really challenging topic to write about. It’s broad, it’s subjective, and it’s incredibly personal. 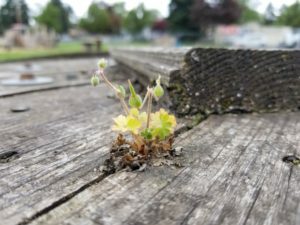 Growth can come in many forms, and can mean different things to those who occupy its space. For me, growth has manifested for me in building relationships, learning new skills, and opening myself up to new ideas. With all of these new experiences comes new responsibilities, but also a lot of opportunities. Since I started becoming involved with Arte Soleil last fall, I really believe that having such a wide variety of other creatives around me has opened me up to a multitude of new experiences I wouldn’t get anywhere else. For one, I don’t usually consider myself leadership material. As one of Arte Soleil’s Core Creative team, I find myself as part of a group of leaders who want to see Arte Soleil succeed. One of the things I touched on in my last blog post was how wide a variety of experiences come through our creatives. We have come together on a spectrum of experience to combine our knowledge, creativity, complexity, and strategy to further Arte Soleil’s progress and continuation. Arte Soleil could not exist without our cooperation and our willingness to open ourselves up to the needs, ideas, and oppositions from one another. I think our drive to make this project succeed allows us to open up to people we might not otherwise have a chance to communicate with, and we all learn and grow by that experience. I had a great conversation with Nancy Tingley recently about our shared love of Tole Painting – I don’t know anyone else in Portland who is personally into that! One of the hardest parts I’ve found about growth is the motivation to do it. As creatives, we can get comfortable in the work we do, and how it benefits us – but that occasionally leaves us stuck doing the same thing. That comes to me in two mindsets – “You don’t need to try something new, this is working just fine” and “You don’t need to try something new – it won’t be as good as what you’re doing”. One of the biggest motivators I’ve found, though, is watching other creative’s process. I love seeing how all of the creatives work, and the different ways they do their work. It’s surprising how even just one tiny little detail can spark inspiration to do something just a little differently than I did before. A color shift, a wired shape, a shading technique, a craft element… all of those things are a way to connect with my fellow creatives, and with my own work. Arte Soleil houses so many individual creatives that come with such a wide range of technical skill and general craft know-how and just getting to sit and talk with some of them or watch them during studio hours is inspiration to try! What I think I’m trying to get at is this: Community is also really crucial for creative growth – creativity doesn’t exist in a vacuum, and creating community *around* creativity gives us all a place to grow if we open ourselves up to each other. I think there is something really wonderful about people coming together, sharing, and supporting each other to succeed. That support is needed in order for us to grow and thrive as creatives, and I think it’s better not to have to do it alone – so, I’m glad there is somewhere like Arte Soleil to keep us connected! Thank you Roz for such inspiring words! Nice article, Roz! Thanks so much for sharing your thoughts, experience and perspective. This is, in itself inspiring. I’m not a real social person but coming to Arte Soleil is great because I get to see great work and feel great energy and get to enjoy everyone and it is contributing to my growth!